Home Improvements USA is an exterior home remodeling company that serves the greater Chicago metropolitan area. We are manufacturers and general contractors who specialize in Windows, Doors, Seamless Siding, Roofing, Gutters, Soffit, Fascia, Gutter Cap & Heater Cap. Steve Tenute, is the patent holder of Gutter Cap and Heater Cap, and Gutter Cap Stone Coat. It has always been important to him to not only carry quality products, offering quality products like seamless siding and seamless gutters, custom made to fit each home, but to keep on improving on those products. His innovation and determination has made it possible for Home Improvements USA to stand behind every product we carry with lifetime labor & material warranties. Who ever heard of a homeowner purchasing home exterior products and enjoying the experience? 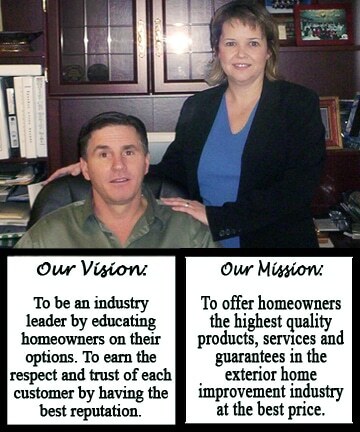 In 1984, Steve and Julie Tenute started a home improvement company based on the experience that they would like to have if they were purchasing the products themselves. Steve and Julie wanted to help customers be able to distinguish contractors you can trust from the disreputable contractors, so they helped write a contractor’s standards guide. We want our customer’s to feel secure in their homes and purchases. We don’t want to ever say to our customers, Well, you got what you paid for. Home Improvements USA carries durable products with lifetime guarantees so that the homeowner only has to buy the product once. We believe an educated customer is a happy customer, which is why we provide educational product reports. Please, take the time to look at the free PDF links on our Homeowner’s Guides page. If you’re not buying, we’re not selling. High-pressure selling tactics are not part of our selling philosophy. Instead, we provide detailed information based off of our client’s needs to help them make the best buying decision. Our reps are required to go through ongoing product training to help them to be better consultants for our clients. Home Improvements USA has been fortunate to be among the select few chosen by Wells Fargo Financing for their financing options. Wells Fargo’s simplified credit application makes it quick (usually within minutes) to get the financing you need to get the project you want. Quality products demand quality craftsmanship. The installation training should be at our expense not on the job at the client’s expense. Home Improvements USA takes this to a new level by a hands-on installation training center at the Naperville facility. An installer, even if experienced, is required to be certified at our training center before they do any work on a client’s home. Excellent service should be a standard and not a premium. We know that promptly follow up and communication is important to our clients. Service issues are resolved within the client’s time frame, not ours. We follow up after each job completion to ensure that the job was done properly in the eyes of the homeowner. Please look at our blog to see the completed surveys. We want your business for a lifetime! The best compliment that we could ever have is when we get a repeat customer or a referral which is why we offer a repeat customer discount and a referral reward program. There is no limit to the number of referral fees you can collect and you will get a repeat customer discount every time you use our company for future projects.